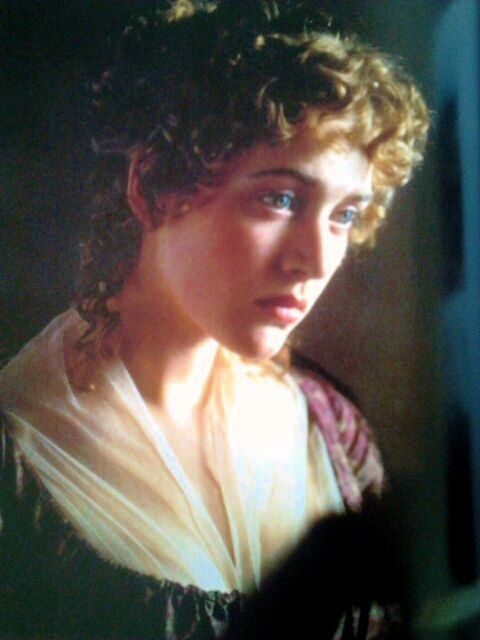 In 1995, Emma Thompson did a very good thing. Not only did she devise, write and act in a film adaptation of Jane Austen's wonderful romance novel, 'Sense and Sensibility', but she also published the diaries that she kept during that time. And what a delightful collection of anecdotes and observations they are. As you might expect from Emma Thompson, this is a hilarious book, full of witty, self-deprecating remarks that we have come to expect from this clever, entertaining and funny woman. 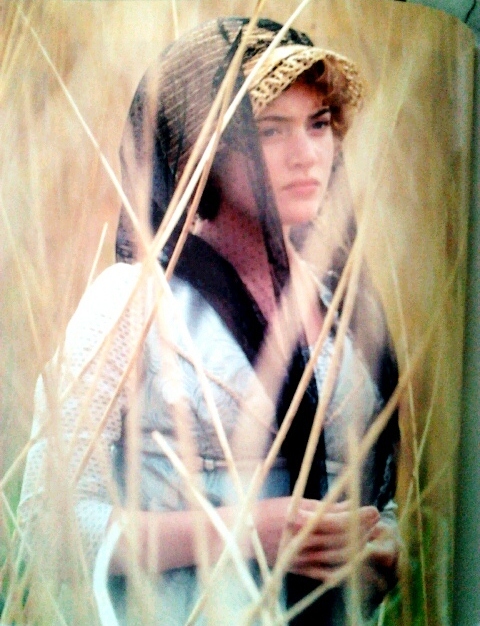 A taste: 'Bed with the script, Austen's letters, a sore back and wind. Inside and out.' This book is awash with wonderful one-liners. It strikes me that Thompson is very much like Elizabeth Bennet who is described by Mr Darcy as taking great enjoyment 'in professing opinions that are not (her) own'. In fact, Ms Thompson's tongue is firmly stuck in her check most of the time. And, in this regard, she is the sister that Jane Austen should have had. 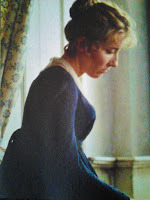 Her style of writing mimics Austen's own gentle ironic style, as she forces the reader to focus on what is not said and what is communicated only between the lines. Thompson seems to have an innate understanding of Austen's feelings and brilliantly captures the vulnerability of these women in reduced circumstances and also the passion and depth of feeling that the sisters embodied. And after all that she still manages to demonstrate their lively intelligence and that of the author. In truth, she loves him dearly and often comments on his fine acting performance. The more astute of you may notice the anomaly in the photograph opposite, which shows a kiss that never took place in the edited film version. But it does happen in the screenplay. As Edward and Elinor finally come together and reveal their mutual feelings of love, there occurs a tiny, beautifully written scene, complete with a kiss. If you want the tantalising details, you must go to the book! For Emma Thompson walks the oddly uncomfortable yet fine line between the grown-ups and the children, the production team and the acting talent. She has a foot in each camp and it is very enjoyable to observe her lady-like efforts to maintain the balance between the two. Here is just one example. Director Ang has gathered the cast together at the end of the day's shoot. You can just about hear the suppressed laughter bubbling to the surface in this sentence. Like a school girl, trying to be good really, but succumbing to the infections giggles of her classmates, Thompson remains serene but at any moment you just know she is about to explode in uncontrollable fits of laughter. And this light-hearted giddiness is the overall tone of this most beautiful of books. 'Sunday 30 April 8:20 a.m..... Greg Wise (Willoughby) turned up to ride, full of beans and looking goregeous. Ruffled all our feathers a bit'. 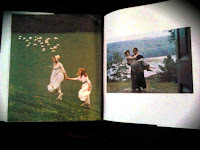 'Sunday 30 April 7:30 p.m. ... 'fantastic outing, sunny drives, five courses at ... hotel and skinny dipping in the river.' Sounds like love to me. Go Emma! 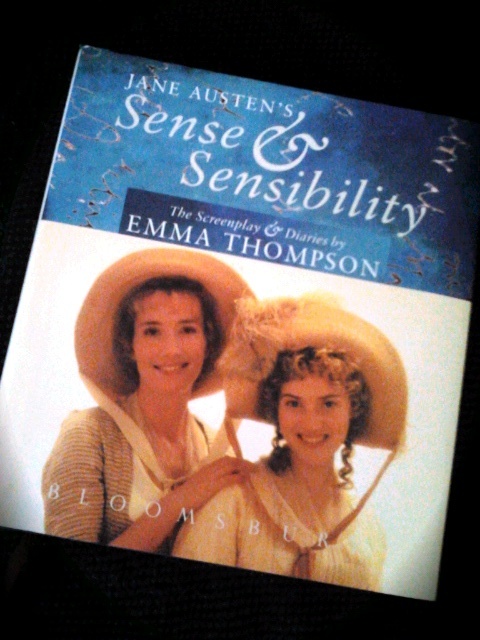 'Sense and Sensibility, the Screenplay and Diaries' by Emma Thompson, is one book that just would not work on a Kindle. The stills alone, some of which you can see here, are to die for. They are taken by gifted photographer Clive Coote who succeeds in creating little portraits that look just like paintings; framed moments of beauty, that are quite breath-taking and very much in-keeping with director Ang Lee's artistic sensibilities. I do not keep this book shut-up tight on my bookshelf, but have it sat upon a book stand, open at various pages during the year, depending on my mood. It is a work of art, made for dispaly, so display it I do. 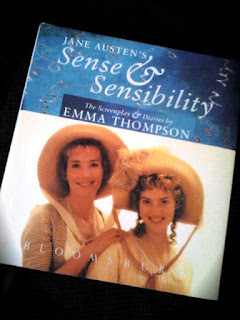 If you do not own this book by tea-time, as any self-respecting Austen fan should, 'I shall swallow my own bonnet!' Go buy this wonderful object and enjoy every picture and every word. It is all the chocolate you will need this Easter!